This quote from L. R. Knost, a child development researcher and author, has crossed my path numerous times in the past year and it struck a chord in me from the first. Had I seen this 10 years ago when I was deep in the little one/big emotion drama, I would have printed posters of it to hang around my home as a constant reminder. Not that I didn’t know this—I knew my son was little; I knew that he was the child and I was supposed to be the grown up; that he would learn how to deal with these emotions by watching me. But as we all know, parenting is every day, hour after hour, and it’s intensely personal, and there were simply times when I admit I walked right into his chaos cloud, breathed it in, and allowed the situation to shatter my calm. One of my favorite ways to address the behavior when everyone is calm is positive practice: think of something you would want them to do in a moment of strong emotions and practice it over and over while they are in their driver’s seat. Big hugs and special rewards come with successful practices! The more they practice the more likely they might naturally demonstrate it when things start to go bad. Teach them to breathe and remember to breathe yourself (“Sometimes you’re only a few breaths away from feeling better” –Amy Poehler… indulge me, I love quotes). It was a nod to my speech-language pathology background that I mentioned “using your words.” Children benefit every time we give them language for their emotions and actions. Now I’ll speak from my Kindermusik educator angle: Music is magic!! You don’t have to be a great musician to use music to your advantage. Sing something or play some music to change the atmosphere. 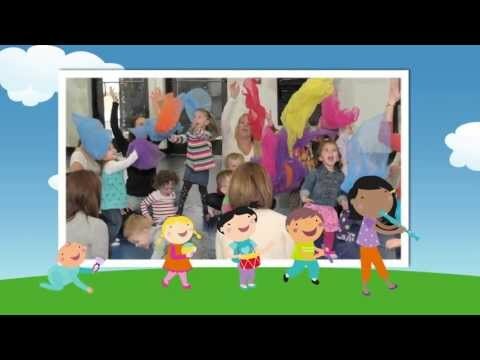 Gauge what the situation might need: an upbeat song that might inspire some dancing; a silly, distracting song (“The Duck Song” on Youtube was a favorite with my kids—a somewhat irritating earworm of a song but effective! ); or a quiet song that might inspire some calm and reconnection. The same thing will not work every time so be prepared with your “bag of tricks” to respond when these intense emotional moments arise. 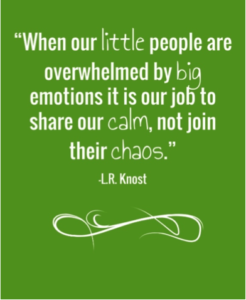 We have the privilege and responsibility to coach our children as they navigate these big emotions and learn how to cope. So take a breath, keep calm, and then pass it on! Previous post: Advice to a Parent – Say YES more often! Next post: Gratitude with Intention – a Powerful Choice!